John Brennan is all over the news, playing the victim for having his security clearance pulled. It’s obvious from his record that he should have never had any access to classified information considering his toxic and radical views. After Helsinki, Brennan accused President Trump of treason. He’s since doubled down on the accusation. But if you want to see treason, look at his own past comments. As I discuss in today’s article on Twitter’s censoring of David Horowitz when he tried to discuss Brennan’s record and Islamic anti-Semitism. 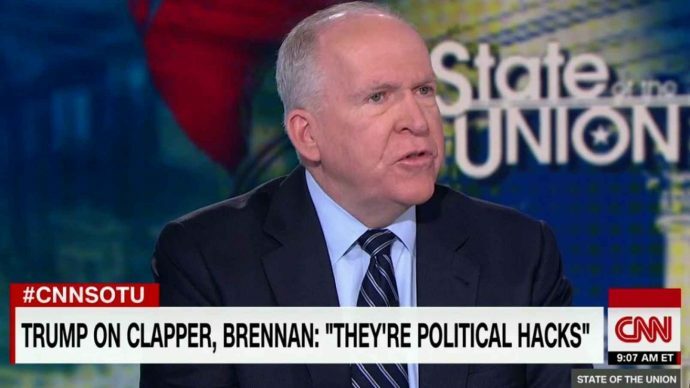 After the Helsinki press conference, Brennan claimed that Trump’s remarks were “nothing short of treasonous” and that the president “rises to & exceeds the threshold of ‘high crimes & misdemeanors.’” Meanwhile in ’09, Brennan claimed that Hezbollah, the Iranian proxy Islamic terror group responsible for the brutal murder of numerous Americans had “evolved”. Here, from The Nation, is the full text of Brennan’s comments on Hamas and Hezbollah.